What if you could make ANIMATION QUALITY VIDEOS without learning animation? Now you can INSTANTLY become an ANIMATION BOSS like the big animation studios in just a couple of clicks! Bring Your Videos To Life! Transform your lifeless videos into ANIMATION MASTERPIECES at our special introductory price! Click the BUY NOW button below before the price increases. 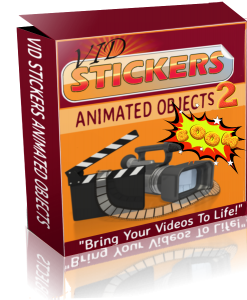 VidStickers are cool animated objects, that will make your videos stand out and inject them with that all important attention grabbing “motion onset”. VidStickers are UNIQUE. Up until now, animations such as these really had limited use for average people, BUT, as video creation software (such as Explaindio, VideoMakerFX etc) evolve, suddenly there is a DEMAND for animated elements. VidStickers fills the demand! AND you won’t find these ANYWHERE else. That is because we do not outsource. ALL of the VidStickers animations have been designed BY ME! You can’t get any more EXCLUSIVE and UNIQUE than that. Each VidStickers object has been carefully thought out and are assets you will actually use in your videos, not just “gimmicky animations” you may like but aren’t useful. Using VidStickers is super simple. Just open your favorite video creation software and add the element of your choice. VidStickers come in SWF, MOV, Animated GIF, and PNG so they are compatible with virtually any software that allows you to import elements. Here’s What VidStickers Can Do For You! 1. Keep Attention On Your Message: Animation keeps people watching. People are used to seeing the typical slide in- slide out- animations that are common in video making software. Familiarity causes “ad blindness”. VidStickers add ATTENTION GRABBING ANIMATIONS that keep eyes glued to your message right to the end! 2. Professional and Memorable: VidStickers motion graphics add a professional air that will rival that of an industry animation studio, without having to know any animation at all! Just open your favorite video maker software and insert your VidStickers, and start making REAL animated videos! 3. Increase Conversions and Profits: It’s no secret that attention spans are shrinking! VidStickers keeps people interested and watching right to the end- and that’s where the magic happens! You “Call To Action” message will actually get seen. When more people SEE your message, more people ACT and the more MONEY you make. It’s all about the numbers! 4. Liven Up WebSites and Slide Shows Too: VidStickers come in 4 different formats. They can be inserted into web pages and slide shows too! So ALL of your visual media can spring to life! p.s. ALL of the animations on this site are VidStickers. Pretty cool huh? How To Claim Your VidStickers 2 Earlybird Discount And Special Bonuses? When you choose ViDStickers 2 today, you will receive the entire HUGE bonus collection above from me. This is a way for me to say Thank You for liking my recommendation ???? When you reach the VidStickers 2 checkout page you will need to see the ID 57951 as the referral ID. This will not be in the url. It will be in the small grey text section at the bottom of the page. See image on the right. If you do not see this ID you are not buying though my link and will not see the bonuses available to you inside JVZoo.